I've been really excited about decorating the banisters for Christmas, but the tough part is affording those gorgeous garlands, trimmings, ribbon when it seems like there have been so many more important things that have had to be purchased in the aftermath of moving like washer/dryer, mattress sets, etc. I knew I needed to be thrifty as possible, and as I mentioned in my Christmas mantel post, I didn't spend much this year thanks to a truckload of free trimmings from a local Fraser fir tree farm. 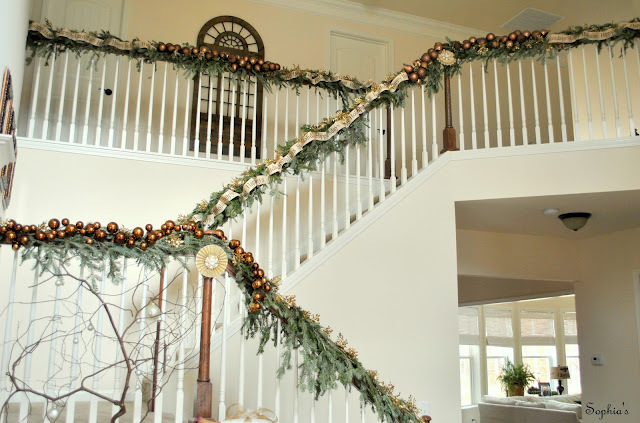 I may have saved buying greenery or artificial garland, but I certainly spent a bit of time because I individually wired and wrapped all this greenery to the banisters....each little branch. I then added all the copper ornaments individually by wiring them to the greenery and then added the cutest "Happy Holiday" ribbon from Michael's that reminded my of that Pottery Barn garland from their catalog last year. 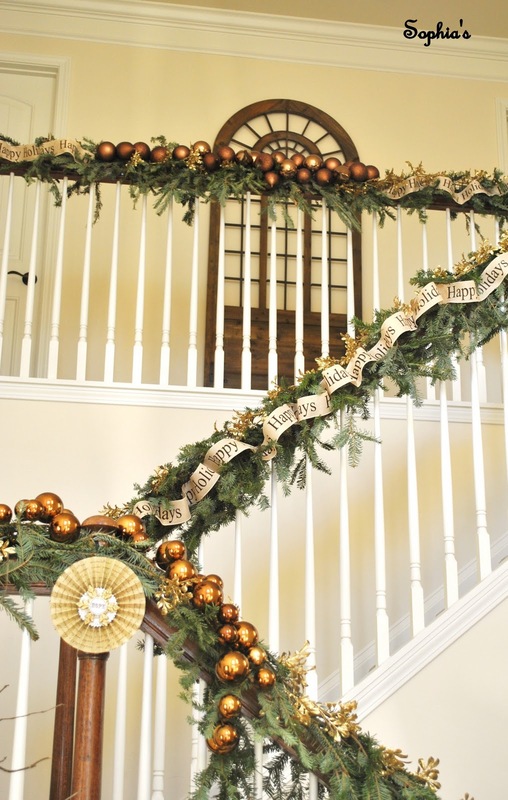 If you look closely, the bottom banister doesn't have the ribbon because I ran out! I've scoured many Michael's trying to find more and just when I thought I would have to give up, I found one roll tonight that I'll be adding tomorrow! As much as I hated to do it, I purchased the "shatterless" ornaments. I really like the good ol' glass ones better, but with a two-year-old that thinks they are "bouncy balls", the shatterless is probably a better option. 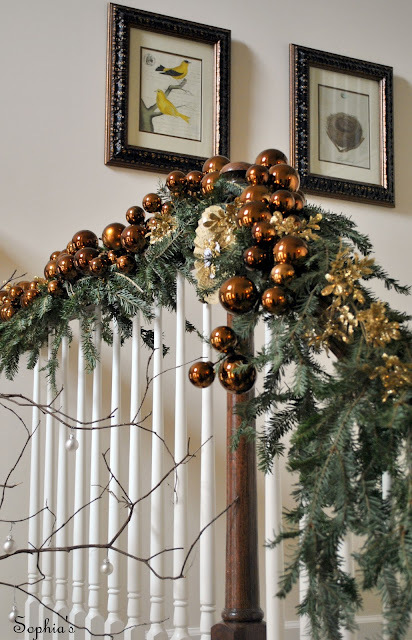 Although my formal living room is predominantly decorated in a silvery theme, I chose to use the copper and golds for the staircase and entryway because of the current decor and pictures already there. 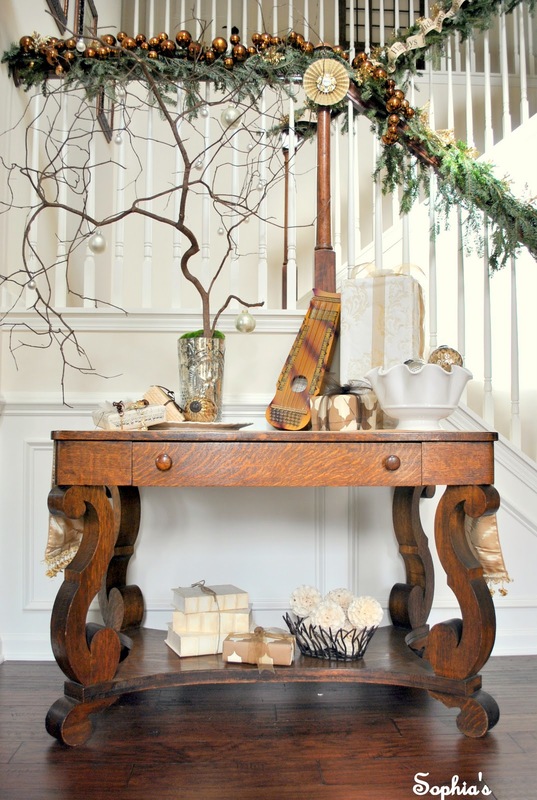 Up next... the front porch all dressed up for Christmas! It is gorgeous! You did a great job! I love your banister. You got that holiday garland from Michaels? I am running out to try to find that. It looks exactly like the PB one from last year. That's what I thought it was until I read your post. Thanks so much for sharing at DIYbyDesign's banister party. Fantastic "Christmas Stairs". You did an awesome job and I would bet that you achieved your childhood dream. That is a large part of Christmas, fulfilling dreams. 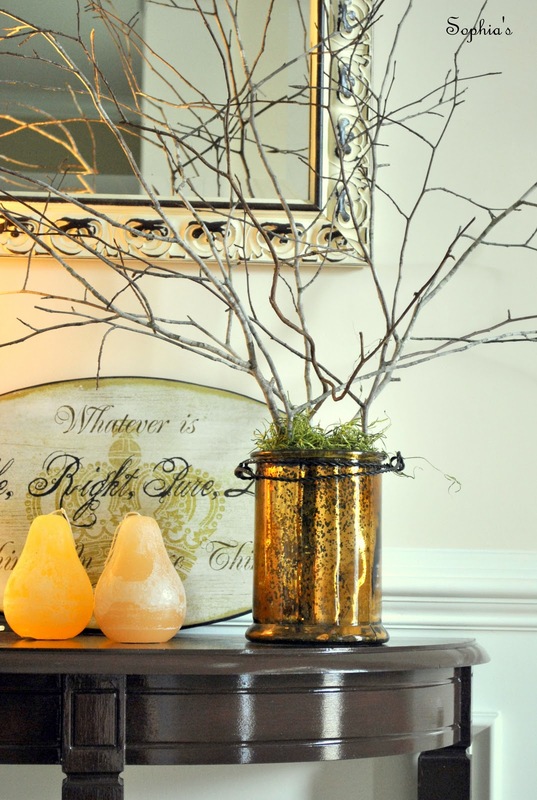 The copper ornaments are beautiful and the ribbon is the crowning touch. I am so glad that you found another roll. I wasn't kidding when I said that I loved that holiday garland. I ran out to Michaels after I left you the comment and bought three spools. I gave you a shout out today on my blog. Thanks for the tip. Kristen it is gorgeous. Funny thing about the ribbon. Last year when making stuff for my booth for the Christmas time in well September- I had used old piano player rolls and cut them in half and then stamped them with individual stamps to spell Happy Holidays - all down the four rolls. I was doing it to use on my booth space tree. Then about 2 weeks before setting up my booth - the PB catalog came out with their ribbon- oh I felt sick..they were now selling what I had done months ago..haha I love it all. Wow, that was a lot of work wiring all that together. Looks great. Stunning... !! Can't imagine the time you would have spend to bring this to perfection !!! Loved it.... Love the copper ornaments... the holiday ribbon... It all looks perfect put together... !!! and the pictures look like straight out of a magazine !! 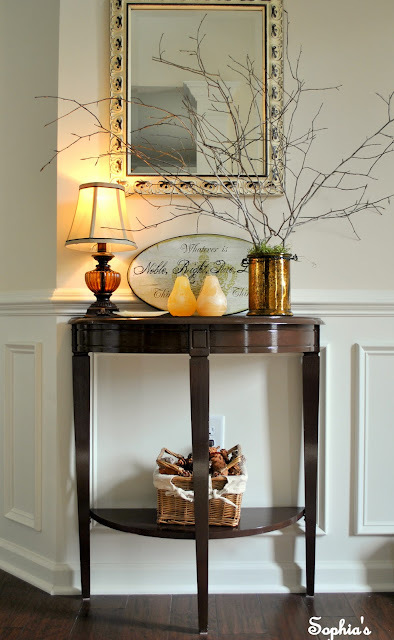 Gorgeous - here via Southern Savvy Style. I can't imagine how long it took you to do this, but it is amazing. Totally feel you with 2 year olds and their bouncy balls! This summer, mine was totally bummed when I wouldn't let him bouce the watermelon! Wow, your home is beautiful, the garland came out wonderfully! Gorgeous! I love your stairs! So, so beautiful!